Give your blonde hair the attention it deserves! Blonde hair requires daily care to make sure your colour stays vibrant and shiny. 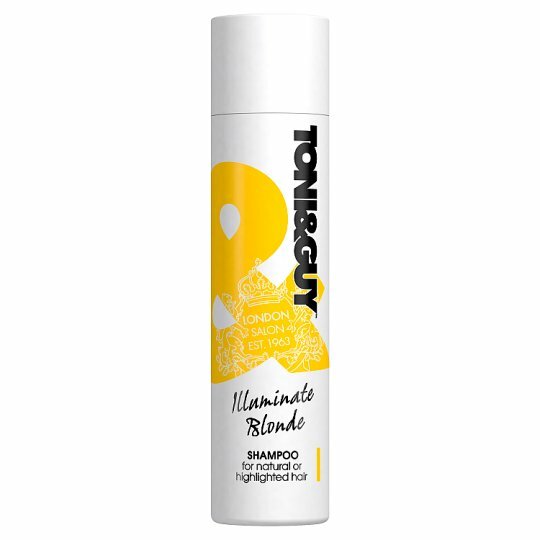 Toni & Guy Illuminate Blonde Shampoo formulated with Pearl Extract, is part of our system that enhances vibrancy and shine of blonde hair, giving your hair a boost. Developed for both naturally blonde and highlighted hair this shampoo will help look after your blonde hair! For best results, massage onto wet hair from root to tip and rinse thoroughly. Follow with Toni&Guy Illuminate Blonde Conditioner for best results. Pair with a styling product from one of our styling ranges – texture, smooth or volume to create a style and complete your look. Give your blonde hair a style to turn heads! Born in London from a love of fashion, Toni & Guy products are inspired by catwalk looks and high street style, to create standout hair styles. Toni & Guy celebrates individuality, empowering you to express your style through hair and fashion and to create your look from the hair down. Looking for hair style inspiration? Check out our website toniandguy-products.com for professional tips on how to achieve salon inspired hair styles. Go to allthingshair.com for hair tutorials, trends and product recommendations. We would love to hear your thoughts! If you enjoyed using this product, please share a review.